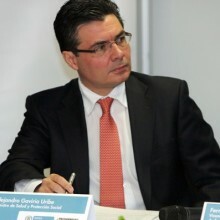 Alejandro Gaviria is the 3rd and current Minister of Health and Social Protection in Colombia. He came into office on September 3rd, 2012 during the administration of the President Juan Manuel Santos Calderon. During his professional career, he served as the deputy director of National Planning in Colombia, the deputy director and a research associate of Foundation for the Higher Education and Development (Fedesarrollo), and worked as a researcher in Washington, US at the Inter-American Development Bank, among other positions. He holds PhD in Economics from the University of California (USA) and a MA in Economics from the University of Los Andes, Colombia. Upon his appointment as Minister of Health and Social Protection, he served as Dean of the Faculty of Economics at the University of Los Andes.